The joint cartilage is composed of collagen fibers, which impart tensile strength, and proteoglycan molecules (especially chondroitin and hyaluronic acid), which serve as a shock-absorbing cushion. The hands, as well as weight-bearing joints, such as the knees, hips and spine, are the areas in the body that undergo the greatest stress from the impacting pressure of weight and movement. In order to maintain joint health, it is important that the collagen matrix, or the support structure of the cartilage, remains intact. Glucosamine sulfate has a long history and an extensive body of research highlighting its role in protecting cartilage, the shock-absorbing, gel-like material located between the joints. As the key precursor to cartilage formation, glucosamine sulfate supports connective tissue health to provide full support for joint comfort, as well as integrity and movement, while promoting a healthy inflammatory response. 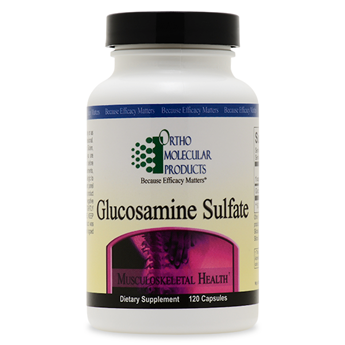 Glucosamine sulfate is also a precursor to chondroitin sulfate and hyaluronic acid, both of which are natural compounds found in the synovial fluid of cartilage. The Glucosamine Sulfate formula is a high-purity product, providing 750 mg per capsule and maximum support for joint health.